To this end, the conditions through which the IEO may occupy a 1,868 square-metre lot in the public area of the port are set out, needed for the execution of the works regarding the new headquarters, as well as the public port areas that are affected by the facility, during the time required for its use and term. The agreement has a term of 35 years from today, and a maximum term of nine months is established for the IEO to submit the construction project. As regards the term of execution of the works, this may not be more than three years after it is approved by the APB. The Director of the IEO, Eduardo Balguerías Guerra, recalled that there is a core architectural project for the future building and for which they will receive a grant from the Directorate General for Innovation of the Balearic Government of three million euros from the European Regional Development Fund (ERDF). 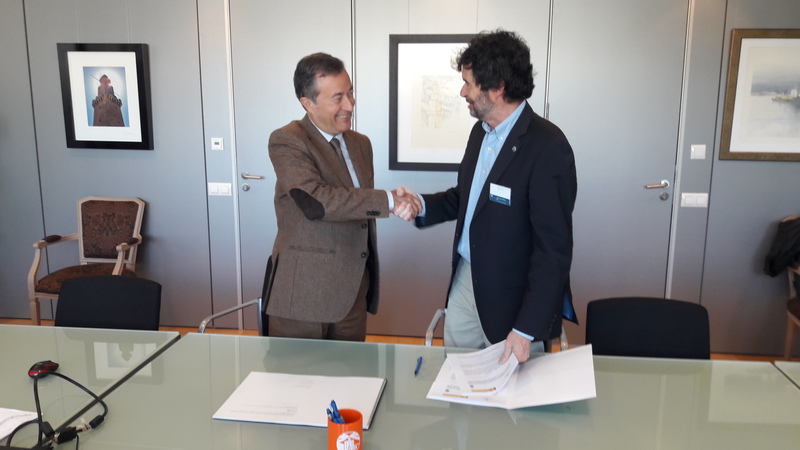 For the director of the IEO-Oceanographic Centre of the Balearic Islands, Toni Quetglas, an important step has been taken today for the construction of a new space for the research body, since its current headquarters, also located in the port of Palma, in the gardens of the Paraires docks, is now too small and cannot be expanded due to building protection laws. Regarding the port, the president of the APB, Joan Gual de Torrella, has highlighted the importance of reconverting the Old Dock of the port of Palma into a research centre and bringing it closer to the public.